Asian stocks clawed back losses on Friday as China’s efforts to bolster investor confidence helped its share markets rally, although data showing the world’s second-largest economy growing at the slowest pace since 2009 capped broader gains. The MSCI’s broadest index of Asia-Pacific shares outside Japan was up 0.3 percent after earlier falling as much as 0.9 percent ahead of the release of China’s latest GDP reading. Spread-betters in Europe expect shares in Germany, where big exporters are sensitive to the health of China’s economy, to fall at the open, with the DAX seen opening down 0.15 percent. France’s CAC 40 is expected to open 0.04 percent lower, but the FTSE 100 is seen rising 0.24 percent. China shares see-sawed but were up firmly in early afternoon trade following statements of government support for the market. The Shanghai index, which in the morning fell to its weakest level in four years, turned around to gain 2.3 percent around 0620 GMT. The blue-chip index surged 2.7 percent. The rebound in China followed weakness on Wall Street on Thursday, which had earlier set the tone for many Asian markets. The Dow Jones Industrial Average fell 1.27 percent, the S&P 500 lost 1.44 percent and the Nasdaq Composite dropped 2.06 percent. As the Asian day wore on, investors in China shrugged off data showing that China’s economy grew 6.5 percent in the third quarter, its weakest pace since 2009 and below expectations, as a campaign to tackle debt risks and the trade war with the United States weighed on the economy. 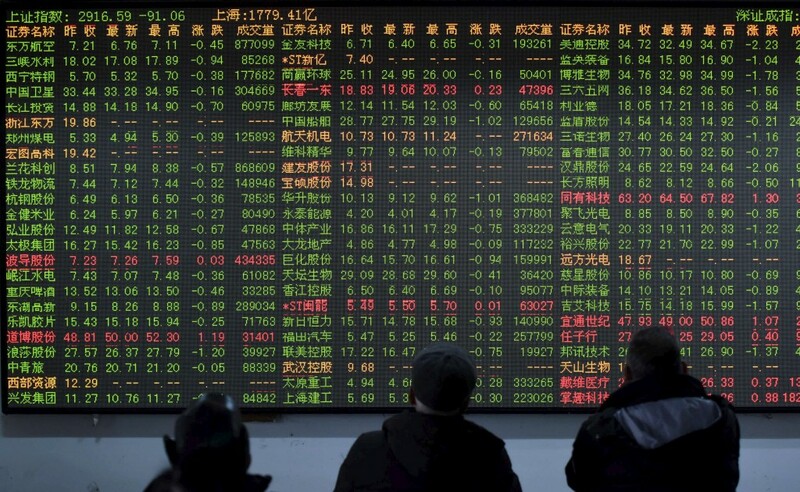 Shares in China had initially sputtered at the open of trade, then firmed as investors digested statements from senior regulators pledging support for private firms and companies facing liquidity problems. Kota Hirayama, senior emerging markets economist at SMBC Nikko Securities in Tokyo, said that downward pressure on Chinese growth in part reflected the impact of Beijing’s long-running deleveraging campaign. But analysts cautioned that China’s economy would continue to face difficulties. “Looking ahead, economic outlook is not optimistic with exports facing further headwinds as U.S. tariffs kick in and demand from emerging countries ebbs,” said Nie Wen, an analyst at Hwabao Trust in Shanghai. China’s premier said this week that the economy faces increased downward pressure, but that government will take measures to stabilize growth amid the trade war. In the latest trade war volley, the U.S. has requested that a World Trade Organization dispute resolution panel look into tariffs imposed by China, the European Union, Canada and Mexico in retaliation to U.S. tariffs on steel and aluminium. Further fraying market nerves, the European Commission on Thursday said a draft 2019 budget from Italy was in “particularly serious non-compliance” with EU rules, setting the stage for a possible unprecedented rejection of the country’s fiscal plan. On Thursday, the flight to safe-haven assets partly dampened rising U.S. Treasury yields. On Friday, however, the 10-year yield rose to 3.1826 percent from the U.S. close on Thursday of 3.175 percent. The two-year yield, sensitive to expectations of higher Fed fund rates, rose to 2.8871 percent. The euro was up 0.1 percent at $1.1464, while the dollar index, which tracks the greenback against a basket of six major rivals, was a touch higher at 95.925. The dollar was up 0.23 percent against the yen at 112.44 . Oil prices ticked higher after falling on Thursday. U.S. crude was up 0.4 percent at $68.92 a barrel and Brent crude was trading at $79.61 per barrel, also 0.4 percent higher. Spot gold gained 0.3 percent to $1,228.60 per ounce.